While styling the kitchen recently, I had a moment of clarity. and they are on repeat all.the.time. I love something with the character of warm wood. Something with a bit of vintage charm. And something with a whole lot of amazing metal patina. My island area is a perfect example. It is a mix and mingle of this and that - new and old- vintage and fresh. The wood island has a decidedly antique feeling with carved legs and details and an open shelf underneath. On top, I have added a chunky slab of marble that was leftover from our countertops. 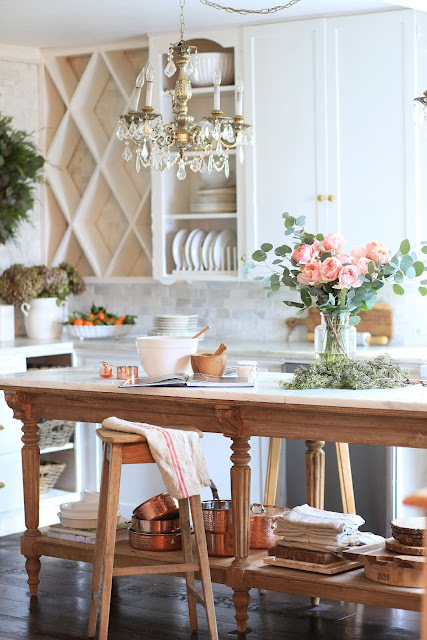 Above, there are 2 vintage chandeliers and below- a stack of gorgeous copper beauty. And of course, the kitchen is in the book. Including a view you haven't seen before. And in that view- you will see more of that deliciousness. I will admit that I am mildly obsessed with copper. As a focal point. As an accent. On the shelf. Behind the range. I love it all. And last year when I was working on a separate project- I discovered a company that makes such gorgeous copper pots and pans- they completely knocked my socks off. Lagostina has been making cookware since 1901 and is Italy's premium preferred cookware brand. And they make the most amazing cookware of all kinds. But of course, my absolute favorite is the Martellata. In case you are wondering- yes, we do cook with our copper. And copper is amazing to cook with. And even better- when you are not using the copper pots and pans- copper can be left out and enjoyed as a display instead of tucking away into the cupboard. This is the EXACT set I have and love and I am so thrilled to be able to give a set away to one of you! NOTE: A lot of you have had trouble with Rafflecopter- if you are NOT able to register your entry- you can simply leave a comment but let me know the name you followed with. Follow LAGOSTINA on Instagram - leave me a note letting me know. SHARE the giveaway on FB or IG - leave me a note letting me know. 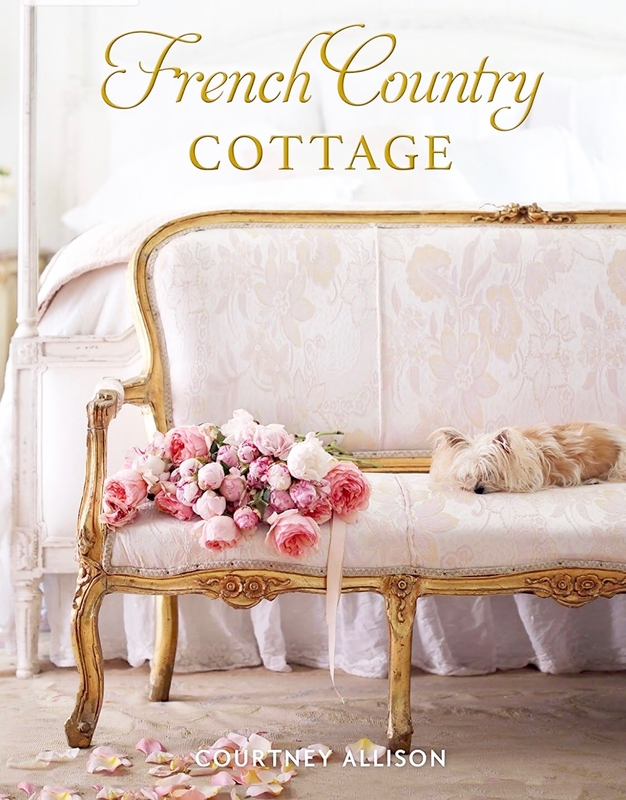 Subscribe to French Country Cottage email list- leave me a note. I have a special EBOOK all about Tips for Getting that Vintage Kitchen Look that I will be sending to Each and Every Pre-Order through Monday as a thank you. Love, Love these pots, so fabulously French! Shared the post on FB. I love Copper pots since forever! I love how you display them! Oh those are so beautiful! I love them! Thanks for the chance to win them! They are beautiful! I signed up for your blog just last week and I'm loving it! I'm following LAGOSTNAUSA on instagram. lOVE COOKING WITH COPPER! Following Lagostina on Facebook. Love your beautiful blog!! Would love the pots!! I have some copper and love using it.Thank you for a chance to expand the collection! I am waiting for your book to be shipped. Love your blog, it is so beautiful and inspiring. Would also love to own the pots, love copper!!! I just started following Lagostina's gorgeous Instagram. Thanks for the tip! I'm a long time followed of French Country Cottage! I'm closely following.. as I do EVERYTHING you do and say! Your style, along with your talent, is so inspiring. Thank you Courtney for sharing and can't wait for the book! Do shiny and beautiful, following Instagram and looking forward to your book. Followed Lagostina on Instagram and have already pre-ordered your book; eagerly awaiting its release! Hi Courtney! 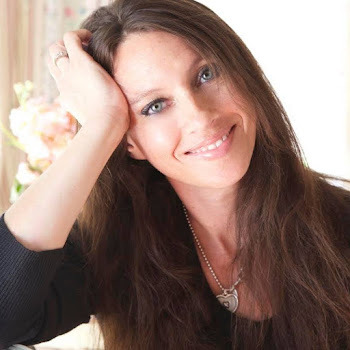 Have been a follower for years-and am now following Lagostina as well! What a beautiful collaboration! Cant wait for your book-pre-ordered through Amazon. Biggest congrats! I am a follower of yours, and I have posted on FB, and am following Lagostina on Instagram. Your kitchen is beautiful, love the old and the new together. I follow Lagostina on Instagram. The set is so gorgeous! I followed on IG and FB! I also get your posts by email, have for a long time. I would LOOOOOVE to win this set, I am sure I couldn't afford it on my own and I have been wanting a copper collection for ages! Thanks for the opportunity!!! I'm following on FB and on Instagram. I'm Sheri Newell Anderson on Facebook and @sheribaking on Instagram. Wow, these pictures are so beautiful, thanks for this opportunity! I can never get enough of your blog and photos! Beautiful copper. I followed Lagostina on FB. Looking forward to your book from Amazon. Love this giveaway Courtney!! I entered as Maison de Mings (@maisondemings) and shared on Instagram stories! Thank you for this opportunity- it would be a dream! Love your French Country style. So inspiring! The pots are beautiful! Following on FB, don't use IG. Would love to win. Thanks. 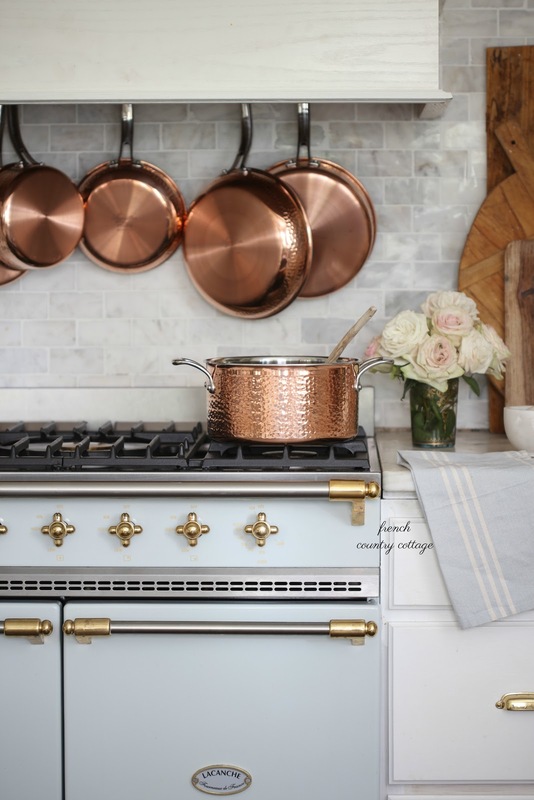 The Lagostina Copper Pots & Pan collection is absolutely exquisite. What a beautiful gift and addition this would be for our kitchen, cooking and entertaining, Napa style! Courtney, most important, I follow Lagostina now because of your introduction! What a fabulous giveaway! I followed Lagostino on Instagram and Facebook and shared the giveaway! Thanks! Following on FB Love your blog.Ordering your book can't wait to receive your book. Ordered Romantic homes magazine also, get my first issue in September.Love all things French Country Cottage! Beautiful! Followed Lagostino on FB! Hi Courtney, I absolutely love your blog, your home, and your photos. I too love copper and would love to enjoy an entire set of copper cookware. I have had a few copper cooking pots in the past but nothing as beautiful as your collection. I ordered your new book and can't wait to read it. What a generous offer from the company. Unfortunately I am overseas, but I think you have a very lovely kitchen. Followed on IG and shared on FB! 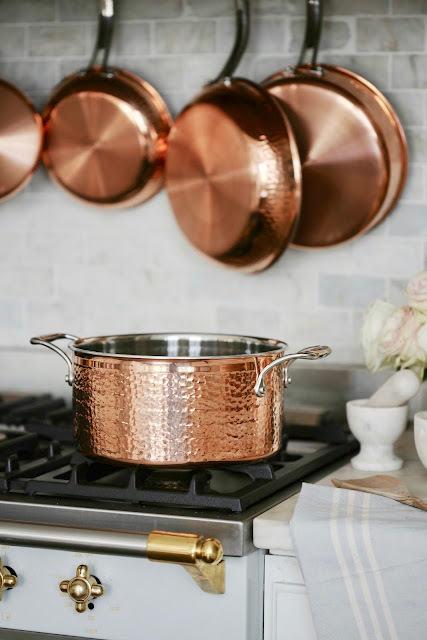 I had copper-bottom pans when I was first married, and this copper cokware look amazing! I followed Lagostino on Instagram. I've always loved your kitchen, especially your use of "this and that." I share that with you. I'd love a set of copper pots and pans, they've always been out of my budget, so this is an incredible giveaway. I have followed Lagostina on Instagram, and I've been a follower of yours for years and years! When is your book coming out? I know how excited you must be! I follow you on FB. Love your site! Love the Copper Pots!! Followed Lagostino on Instagram! Don’t use fb or ig but would love to win. I really enjoy your blog. I was introduced to Lagostina pans over thirty years ago when they first were introduced to American kitchens. I love using these stainless steel pans as they are heavy and clean up well. I use them every time I cook. In fact, I would be happy to be their spokesperson.... I also love copper pans as they are wonderful conductors of heat. I would love a set of Lagostina's copperware as I would use them as I use their stainless cousins and they would look as lovely in my kitchen as they do yours! Thanks. Courtney, P.S. I follow your blog but under another email but couldn't access it to enter the copper event....just to let you know that I am a long time follower but use another email for that.....thanks. First of all congrats Courtney! I didn’t know you had a book coming out!! Cannot wait to order whichnill be doing next! I would love to win those pots! They would be great for styling and cooking! Hope to see you in High Point! I love your site Courtney and I love Lagostino pots and pans! I've had a set for years, although not copper, and they are still as good as new. I follow them on Twitter and will sign up for an Instagram account so I can follow you and them! I have entered love the pots and pans love your kitchen!! Courtney, I love your blog, your style, and your beautiful home! I am following Lagostino on Instagram. It would be amazing to own a set of those copper pots!!! I ordered your book this morning and can’t wait for the arrival! Enjoy your day and congratulations!! I love copper and I was already following Lagostino on FB. I won a pan from them once -- I never got it. I contacted the person with the giveaway -- still didn't get my pan. Wish this could be different. Love the hammered copper! It brightens up any kitchen. Your blog has truly inspired some of the things I've been doing around my home! Thank you.. I believe rafflecopter accepted my entry.. I am following Lagostina on IG and FB. I also shared the giveaway on FB. .I am a retiree with Parkinson's, and I recently gave up my LeCruset for a $10 set of pans. I can no longer hold the heavy cookware. Receiving the beautiful Lagostina copper pans would be a true blessing. I love your blog, and I can hardly wait to see the book! Thank you for the opportunity to win the copper pots and pans. I also shared on Facebook and Instagram. I will keep my fingers crossed! So love all things copper. This post has me following them on FBI. Hope to see some in person! This giveaway is simply amazing! I have been following LagostinaUSA since you hung up their shimmery shiny pans in your pretty kitchen, drooling over them. Checked off all the boxes for the giveaway~~ sharing on Insta, following you both, your blog on my blog roll since day ONE, and your book has been ordered for weeks!! Come on copper gods and let me win this set so I can outfit my lake cottage kitchen in style!!! Love the look of copper in a kitchen!! So warm and inviting. Following you on Facebook, Instagram, email, as well as the company that makes the copper pots. Would love to win a set of my own! I unfortunately do not use Fb or Instagram. But I do follow your blog! Count me in? I also preordered your book when you first posted about it! Just beautiful!! Entered your giveaway. Thank you for doing this! Shared and can't wait for your book!!!! I have the Lagostina risotto pan, which I really enjoy. Would love the copper set to add to my kitchen. They are beautiful and would inspire me even more to try new recipes. Wishing you great success with your new book. Not sure how you wanted us to leave you a note about the giveaway but??? Tried the link to enter but never went through! Love your style. Beautiful and doable. Good luck with your book. Looking forward to it. Thanks again for all the beautiful work you do. My....but they are beautiful!! Thanks for the recommendation. I just started following them on line! These are just beautiful....thanks for the recommendation. Just started following them on Instagram! I followed on Instagram and FB, I have gotten your email for years! The pots are beautiful thanks Courtney. 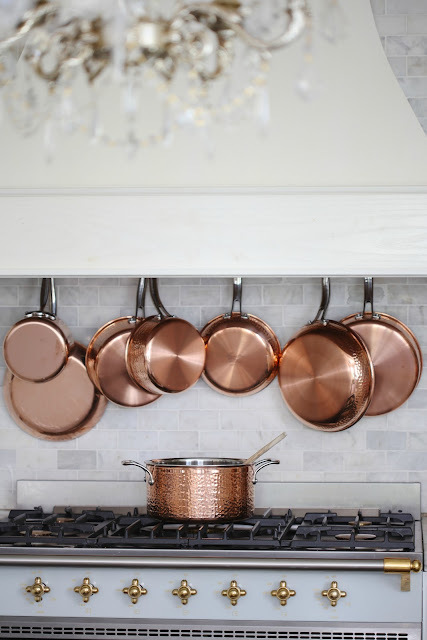 These copper pots and pans are beyond beautiful! Thanks for the giveaway. I am following LangostinaUSA on instagram. I have a love of copper pots! I forgot to mention in my previous comment that I've been a follower of yours for awhile. I'm also following Lagostina on Instagram (trknagy) and shared about them on IG, also. Love and follow your blog. I am a great lover of peonies to. Have some still blooming my father gave me from his garden 44 years ago. The copper is gorgeous. I M off to their site now. Followed Lagostina on IG (crewssherri) and FB (Sherri Crews), shared on FB. I have had a lifelong love affair with copper, these are gorgeous! Signed up for an email subscription - thank you! Thanks so much for allowing us to have a chance to win copper pots. YIPEE, GOOD LUCK EVERYONE. Thanks Courtney!! Oh my goodness, this copper is so beautiful. My kitchen and I would love to own it! I shared on Facebook--don't get how to use Rafflecopter :)! Absolutely stunning copper! Thanks for the chance! I always admire your gleaming copper collection in your kitchen and I have always wanted a copper cookware set of my own. Thank you for the opportunitity to win this Giveaway! I’ve followed Logastina on Instagram. I have a ton of European copper---need to dig it out of our storage & clean it. You inspire me. I have been following your blog for a while so glad you are with Romantic Homes magazine! I am following LagostinaUSA on Instagram. I absolutely love copper! It's so pretty and classy, and it's kind of fun to clean it up too! I love making it shine again! Lol I followed Lagostina on Instagram, shared this post on Facebook, and am already subscribed to your fabulous blog! Very beautiful! Following LAGOSTINA on Instagram @tatzgrrly and shared on Facebook! I love your blog. I shared Lagostina on FB. I can't wait to receive your book, feels like it has been on pre-order for months. Your kitchen is gorgeous!!! I subscribed to your beautiful blog! Courtney, I'm following Lagostina on FB and IG. Beautiful copper! My "chef" loves to cook with copper. He would love a new set of cookware. Thanks for the chance. Courtney, I follow you here and FB and IG. You have long been a favorite for me. I adore and admire your style. The weekly party you host is also a favorite. I link up whenever I have a new post to share. Thanks for all you do to inspire those of us in Blogland. Courtney, you are absolutely right about mixing copper into the mix in your home. We have vintage copper and new copper, mostly in the kitchen, but also in other rooms as cache pots, vases, etc. The warmth of the metal is perfect for our home. Would love to add a new set of cookware. The Lagostina is gorgeous! 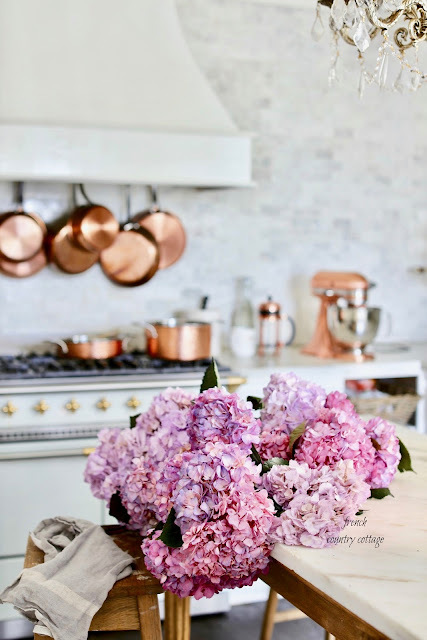 Love copper pots and your blog! Thanks for the opportunity to win these gorgeous pots. IG following, shared FB, email signup...fingers crossed. Thank you! Drooling over the beautiful cookware! Following Logaostina on FB! Couldn't find the link to sign up for your emails. I LOVE these copper pots! The copper pans are beautiful! 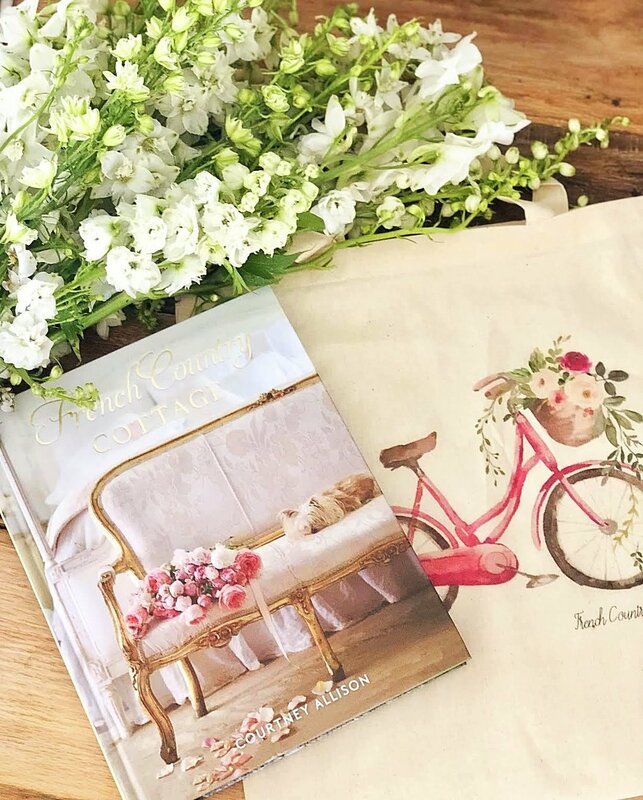 I am now following Lagostina on Instagram and have already preordered French Country Cottage. I just saw these pots while shopping recently and I can’t get them out of my mind! I’ve followed Lagostina on Instagram and posted a link to the giveaway. You might also appreciate my watercolor that I posted of a vintage copper pot with lilacs. I already subscribe to French Country Cottage email list. Followed and shared on Instagram and am already a subscriber and pre-ordered your book a few weeks ago!!! CarolWagnerPfarr on Instagram. thanks!! I follow LAGOSTINAUSA on instagram. It's a beautiful set. This giveaway is fabulous and generous to boot. I am a copper nut (copper, linen and blue/white porcelain)!! I do not do FB or Instagram BUT I did check out their wonderful website and shared it and your giveaway with my girls. Who would not want more copper??!!! Thanks and blessings. Lovely giveaway! Thanks for the chance!! I signed up for your email list also. Shared on IG, followed Lagostina's on IG, and signed up for your email. Love your blog! So love these copper pots!!! Following on FB and IG, shared with friends on FB!! Slowly but surely turning the house into country! You are an inspiration on an ongoing basis. I LOVE your blog and send it to my very bestest friends!!! Love the copper. Love you! Beautiful! and would be such a joy to own and use! I follow Lagostina on instagram. Cannot wait for the book to be shipped! Anxious to see the rest of your dreamy kitchen and your wonderful photos. I followed Lagostina on Facebook and I'm looking for the subscribe to give you my email address. If I can't find it, my email addy is nlh1018@yahoo.com or the g-mail addy. Lovely blog, by the way! I'll link it to mine. I have followed your blog for years, every day either on the Bhome app, or I type in fr and you pop up in my browser. I finally* subscribed. I don't often subscribe since I am sure to follow any which way. But I subscribed. And can't wait for the book. And love the copper pots. Especially in your kitchen. And I drool every time you give a wide shot including all the wonderful details of the kitchen. I would love to cook on some hammered copper. A girl can dream. I LOVE your blog. I really want to enter this giveaway. I am a high school teacher and prefer to not have any social media except Pinterest. I sure wish that was an option rather than IG and FB. Thank you!! Love your blog. Have for awhile now. Copper is so timeless and classic and I have been in love with it since the 60's. Would simply love to have this set. What an heirloom to pass on to my daughters. Courtney, this giveaway is amazing because I have been looking for a nice set of copper pots. I am now following Lagostina on Instagram and I have been a follower of your blog for a long time. I get your newsletter. Even if I dont win, I still want a set of these copper pots when I am able to get them! Thank you so much for this opportunity to win. Absolutely Gorgeous!! Thank you for sharing your beautiful kitchen with us. Thank you for hosting this beautiful giveaway. I follow you on Facebook. Thanks again. Love that cookware! Shared on Facebook and following LAGOSTINA. Wishing and hoping for more copper in my life. The collection really makes a statement in your beautiful kitchen. Thank you for offering an amazing giveaway! You create beauty. I shared your giveaway. I am now following Lagastino. I joined your email list, happily. Thank you! Copper pot giveaway is fab! I signed into instagram following as bobbielelarge....thank u for thispossible gift set of love!!! 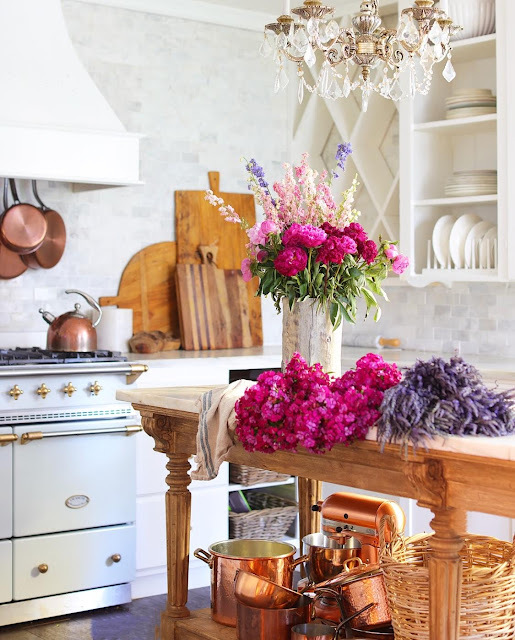 These pots and pans are stunning! I’ve posted on my IG feed and subscribed here. Cannot wait to go through your blog... love it all! Hi Courtney Fortunately I discovered you on IG earlier this year. I love your French style, your blog , everything you do. Your kitchen is especially gorgeous! I love your stove and the beautiful Lagostina copper pots. I followed Lagostina on IG. I’m anxiously awaiting the arrival of your book I ordered on Amazon. Tuesday can’t come fast enough. Congrats on the release. It’s going to be awesome!! I follow Lagostina on Instagram. LOVE their gorgeous cookware! Reminds me of some beautiful copper bottomed pans my grandmother used to cook with! Following Lagostina on FB! Yay for their beautiful copper pans! Absolutely gorgeous! Yay, big time, if I win! And, Yay for your beautiful book! Congratulations Courtney! What a beautiful set. Just perfect! Following on IG @danadenay1967, shared on FB and left a comment in the entry box and am a new subscriber to your newsletter. Followed Lagostina and you on Instagram and shared the blog entry on FB! Completed all steps as directed! Would love and use this gorgeous cookware! Hi Courtney, I have ordered your book and can't wait to receive it. Have Followed and Shared on FB. Thank you for a beautiful blog. I entered your amazing giveaway. I started following you (found you through Sharon Santoni's Instagram post) and Lagostina, I signed up for emails (sallybierman@comcast.net), and I posted your giveaway on my Instagram account (Willoughby_and_family). So glad I discovered you (and not just for the giveaway!). 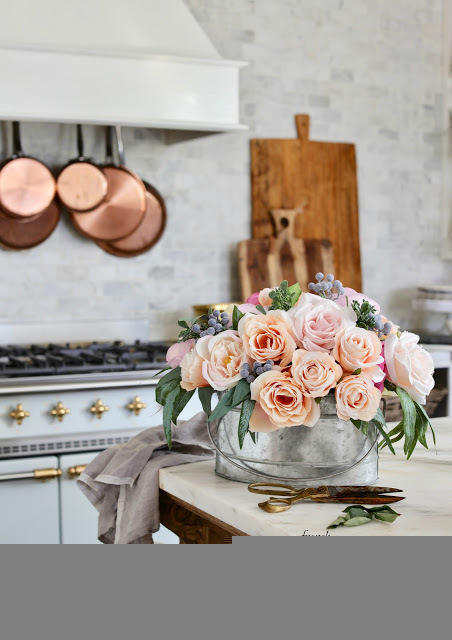 I love the look of your copper pots! Followed you because of Sharon Santoni. Your home looks lovely. Love the copper cookware. I have been a collector of copper for several years. I have posted and followed on Facebook and Instagram. Where did you find the island. It is exactly what I want for my kitchen. Love your style. Our beautiful collection of vintage and antique copper cookware was all lost in the recent CA fires. The beautiful set shown in your blog post is lovely! I've liked, followed, and subscribed; shared on FB, and followed Langoustine on Instagram (as WildSanctuary). Would love to see this stunning set be the anchoring design element to envision a new kitchen around! I have always wanted a beautiful set of cooper cookware like the ones from Langoustine. I was already following langoustine on Instagram!!! Dreaming of many happy hours in the kitchen polishing my well loved Lagostina copper pans. Following on Instagram - love the recent post with a bubbly and a pasta cure for the Monday blues! Suzanna Carter - addition to my earlier post. I also shared your Facebook page. So beautiful! Never seen any like them. Almost too cute to use. I liked your IG page. Also, I shared on FB & Twitter. Wow these are absolutely gorgeous! This would go great with my french country kitchen!! I love the look and performance of copper! I love French Country Cottage! Your sense of style is fantastic! I can't wait to order you book! The Lagostino pots look fabulous! My French Grandmother loved her copper pots and pans, and was an excellent cook! I would soooo love to win these! I shared on FB. Hi Courtney Has the winner been chosen yet? ?